Siri- what’s the current usage of voice searches? We’re sure you’ve used voice search recently to drive back home or to call someone. 41% of adults conduct at least one voice search everyday. According to Microsoft, Cortana has 133 million monthly users! These stats indicate that Voice Search has arrived and is here to stay! What does this mean for a Self Storage Business Owner and Marketer? The surge in voice searches has definitely disrupted the current SEO scenario and requires Self Storage business owners and marketers to tweak their ongoing SEO and marketing strategy to adapt to the new consumer trend of voice queries. Although, text based queries will not disappear but content needs to be optimised for voice searches to ensure improved visibility to the new age consumers. Read our blog is your self storage business “near me” ready to know how you can improve SEO rankings for text based queries. So, what is a Voice Search and how different is it from the Text-based query? The fundamental difference between voice search and text query is the length of the queries and intent. What we speak is different from what we type. A voice search removes all guesswork as the search intent is quite clear and as a result the search engine presents the most accurate results. So instead of getting several unrelated links like in the case of a text-based search, the user will get the most relevant responses in reply to the voice search query. E.g. 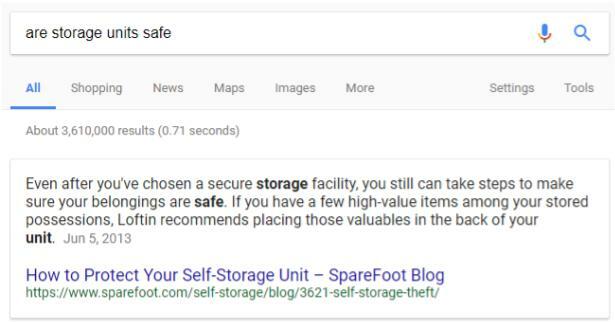 if we want to know about the is storage units are safe, we simply type storage units safety and receive a number of links and search accordingly. But when we take help of voice search, we say are storage units safe and get the best results. Voice search queries are usually in question format so self storage marketers must ensure that the content is optimised accordingly to answer those questions accurately. You need to put yourself in your customer’s shoes and think of all the possible questions that your target audience may ask regarding a rental self storage facility. Content has to be crafted in a manner that it you’re able to pop up in answers to specific complex queries which require detailed answers and not just a simple Yes or No! Ensure to use target keywords in your content wherever possible, without over-stuffing them. This will enable your content to appear when voice searches ask specific questions, thus, improving your rankings. With the influx of innovative technologies, consumers and search engines rapidly adapting to the evolving algorithm changes of the search engines. Modern marketers are literally sitting on goldmine! Voice searches are becoming increasingly popular and those self storage businesses which capitalise on this emerging trend, will surely gain better search engine rankings and drive lead generation. Also, location is critical for voice search SEO. With voice search now able to offer results based on geolocation, your online business listings need to be updated. The slightest difference in the listing could lead to a lower search engine ranking. Long Tail Keywords- Do a little research on the kind of specific questions your target audience is searching for. Ensure to incorporate long tail keywords in your content to be relevant for those search queries. Make it conversational and focused on your customer’s pain points. This will allow your self storage facility to rank better and gain more visibility. By being a problem-solver for your target audience, you slowly build trust with them, enabling long-term relationships. Schema Markup- Implement schema markup to utilise your existing content and provide a broader context to it. It will allow the search engine to understand your self storage website better and yield better ranking for you. 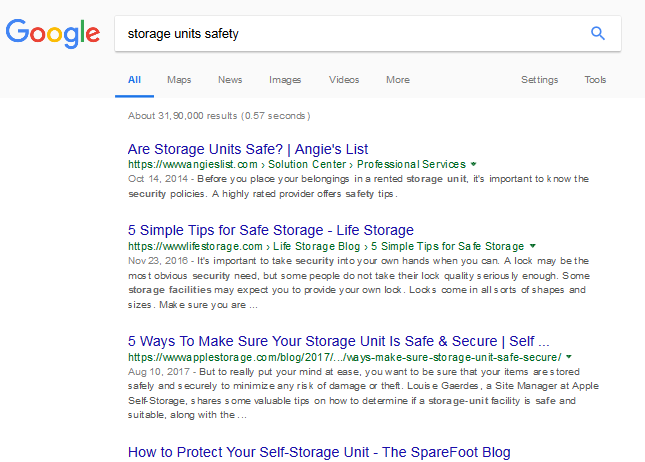 Only a fraction of self storage businesses use schema markup, so it has a huge untapped potential. Updated business and contact information- Business information especially contact details, address, directions etc need to be updated and must be uniform across all listing platforms. Any kind of mismatch may lead to lower search engine rankings. Mobile optimization- If your self storage facility’s website isn't mobile optimised, you will lose out on the race to the top. Not having mobile optimised content and web pages will result in your target audience losing interest and moving away from it. There are more mobile devices used for voice searches than any other device so having mobile-optimised content is critical for long-term success of your self storage facility. Alexa, what’s the future of voice searches? By 2019, the voice recognition market will be a $601 million industry”, according to a report from Technavio via Skyword. Studies indicate consumer behaviours are rapidly changing and billions of dollars are being pumped into the Artificial Intelligence sector. 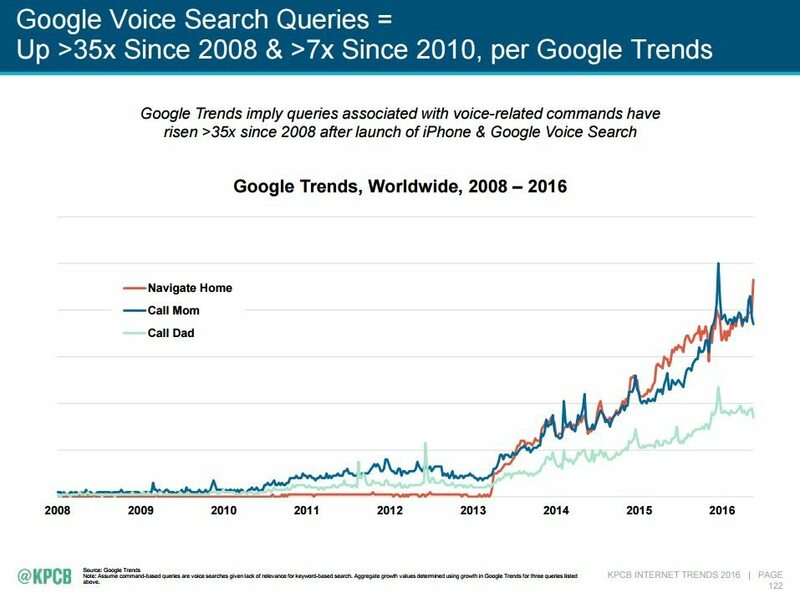 Voice searches are undeniably on the rise and those who ride the current wave and revamp their SEO and marketing strategy will reap long-term benefits. Need help with any aspect of voice searches for improving your business rankings and search results of your Self Storage Facility? Talk to a Voice Search Specialist at Prodigitas. Prodigitas enables modern marketers and small business owners with technology and services to enhance and measure their online marketing engagements.